Based in San Francisco, Hampton Creek Foods makes its home in a space within the city’s technology-driven South of Market neighborhood. Funded by Silicon Valley investors and the founder of Microsoft, Bill Gates, the food-tech company is focusing on throwing a wrench into the egg industry — which supporters of Hampton Creek Foods say wastes energy, heavily pollutes the environment, and restricts chickens to living in very small spaces — by swapping egg products with plant-based substitutes. The company is part of a movement of food-technology ventures aiming to change the way people eat. “There's nothing to indicate that this will be a trend that will end anytime soon,” says Anand Sanwal, CEO of CB Insights, a New York firm tracking venture capital investments. “Sustainability and challenges to the food supply are pretty fundamental issues.” Venture capitalists are increasingly investing in technology companies in their infancy, hoping to reap financial benefits of a start-up’s innovations. In 2008, less than $50 million was invested into food-related start-up companies by venture capitalist firms. Last year, nearly $350 million was streamed into start-up companies looking to change the food industry, according to CD Insights. Hampton Creek Foods is creating plant-based alternatives to eggs in hopes of helping the environment. By reducing the consumption of eggs, chicken, and other meat, the large of amounts of land, water, and resources to produce them is consequently reduced. The health of the public can also be improved, especially in countries that eat a lot of meat, through the nutritional benefits of plant-based food products. Additionally, the risk of foodborne illnesses, like Salmonella, along with diseases like avian flu is significantly reduced. However, the endeavor is easier said than done, as the company will face powerful influences of the food industry, along with a skeptical public. Mitch Kanter, executive director of the Egg Nutrition Center, agrees replacing eggs will be a tricky endeavor. “Our customers have said they're not interested in egg substitutes. They want real, natural eggs with their familiar ingredients,” he says. Kanter also adds that sustainability issues have been, and will continue to be addressed by the industry. Water use and greenhouse gas emissions have been reduced and the lifespan of hens is being lengthened due to better nutrition and living conditions, according to Kanter. These factors aren’t stopping Hampton Creek Foods from pursing its research and sales endeavors. The company is actively searching the globe for plants to replace eggs in products that contain eggs, like cookies, French toast, and batters, to actual egg dishes like omelets. “The egg is a miracle, so one of the hardest parts of replacing it is all the functions that it can do,” says Chris Jones, culinary director of innovations at Hampton Creek Foods and a former contestant on Bravo TV's Top Chef. 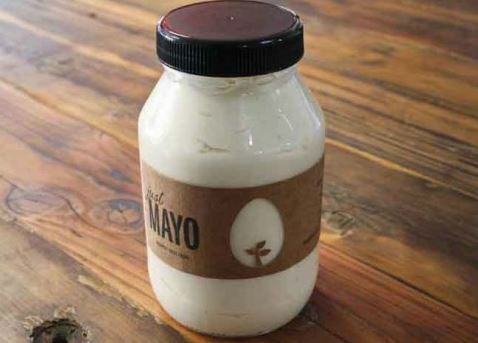 The company’s first product — Just Mayo mayonnaise — is being sold in Whole Foods for roughly the same price as traditional mayonnaise. In the not-so-distant future, Hampton Creek Foods hopes to begin selling plant-based cookie dough and batter that reacts the same way its traditional counterparts when cooked.